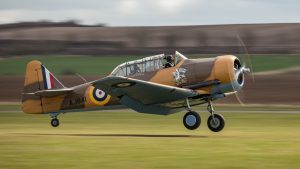 The 3 point landing – I am flying low to the ground at around ‘one or two’ feet i raise the nose until the cowl intersects the horizon and close the throttle. All the above still applies and I keep the stick in to wind to arrest any drift all the way until the three wheels touch down. In a strong cross wind its quite usual to land with the into wind main wheel and tail wheel in a two pointer with the down wind wheel slowly making contact with the ground.